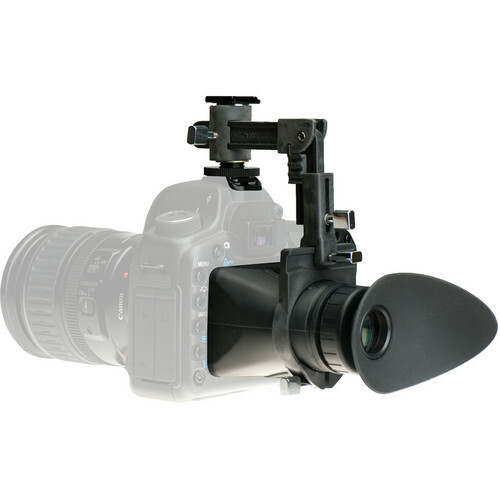 The Hoodman Cinema Kit Pro includes the HoodCrane, a universal hot shoe mount for LCD accessories. It features a spring-loaded latch that moves the crane up and down. It also swings up and pivots out of the way for shared LCD viewing or still shooting. The other items in the kit work in conjunction with the HoodCrane. The HoodLoupe 3.0 provides you with a magnified view of your shot on the camera's 3.0" LCD during DSLR video capture, so you can accurately check composition and focus. The HoodMAG 3.0 is designed to fit the HoodLoupe with a tighter fit than the HoodLoupe standard eyecup, and provides 3.0x magnification. Box Dimensions (LxWxH) 11.4 x 9.1 x 3.0"
Cinema Kit Pro is rated 4.2 out of 5 by 53. Rated 5 out of 5 by TG from Works well when adjusted properly My 5d is used mostly for handheld video and the reason I purchased the unit. First adjust the fit so it covers the viewer properly and fits snug. As shipped required multiple adjustments but it is very adjustable. Test in bright sunlight. No light leak with my unit. Adjust the diopter to match your vision. This requires some trial and error. A tripod and fixed subject at a known distance facilitated fine tuning the unit (getting the focus precise before adjusting the unit.) Works very well and avoids issues with other units that require vendor specific mounting adapters that lock you into their products. Rated 4 out of 5 by Brady from An excellent buy! I just got my new Hoodman Pro in and love it! I read a lot of reviews before buying it, and was surprised at a few of the negative reviews when I installed mine and tried it out. It's a great buy for the price, and an excellent addition to my equipment list. The mounting is simple and very adjustable, as well as sturdy. There IS a piece of protective plastic that has to be removed from the diopter before use,... so I'm wondering if some of the negative reviews about focus issues were written before this plastic was removed. The diopter is adjustable to differing eyesights, and focus is clear. A nice unit, and priced well in a world of over-priced DSLR add-ons'. Rated 4 out of 5 by Anonymous from The Secure Choice I bought the Cinema Kit Pro by Hoodman just before going on a photojournalism assignment in Haiti. I knew I was going to be moving around a lot and in some tight spaces so I really didn't want to risk using an LCD Viewfinder with a magnetic mount. Enter the Hoodman crane, a device that totally fixes the problem in a fluid and stable fashion. The Viewfinder is optically top notch and includes a diopter in case your vision is less the perfect. Additionally there is a cold shoe mount on top which allows you to mount a light or microphone. I will absolutely continue to use this great product. Rated 5 out of 5 by Victoria Photoguy from Now you can see what you're shooting! This solves the issue of working outdoors with a DSLR, It's great for video as well as shooting pictures in live mode. It is a bit bulky but very sturdy in design an build. I have no issues with it staying locked to the hot shoe. But on my model at least I have a heck of a time with thediopter setting staying where I set it. When I carry my camera around my neck the eye cup always gets hit, moves and the diopter has to be reset. Hoping to figure out a solution. Was impressed how solid this is for the price. Bulky for storage but it works well so will adapt to the bulkiness. Would highly recommend this if you have any issues with outdoor shooting. Rated 4 out of 5 by Canonuser1950 from A nice quick video setup Hoodman has come up with a nifty relatively cheap method to use your dslr for handheld video. Once you get it organized for your camera, it's a snap to install a second time. Attaching as it does to the hot shoe, you will be unable to use flash, even your internal flash. It does have a hot shoe of its own so you can attach a microphone or a video light. This is a big improvement over Hoodman's original kit which involved rubber band like straps which were a pain to get on and off, requiring removal of your neck strap. This system won't do for a fully professional kit but, for an aspiring amateur, it works very well. Rated 5 out of 5 by Larry from It solves a monitor glare problem I use it for video capture on my D4, D800E and D600. I was leary before I purchased the kit but was surprised at its' quality and functionality after I received it. Now I can see what is on my moitor and not have to play a quessing game in bright light. I finally was able to capture videos without a tripod. The eyecup acts as a stabalizer when pressed against your eye. I'm into video now. The only problem that I have on my kit is with the 3x magnifying eyecup. I'm not sure you need 3x, but it works. Also the focus adjustment is too loose. I have a problem with it always changing focus on me. Rated 5 out of 5 by Don from Hoodman Cinema Kit A must for anyone trying to shoot video with a DSLR in daylight! For two years I have been frustrated by not being able to see the live view screen in daylight sitauations, resulting in poor focus, and worse composition. I bought my D3100 body primarily for its video capability, only to find it unuseable in bright light situations. Problem solved! The ony downside I've notices is that the hood is slightly smaller than the screen, so some info icons are blocked (i.e. the record icon). There are enough secondary clues visible, that this is a non-issue. The kit works as advertided. The unit quickly swings 'out of the way' for rangefinder use, which I prefere for normal operation. Rated 5 out of 5 by NoozDude from Problem Solved!! Thrilled with shooting video with my Canon T4i. I primarily use it as a secondary camera for cutaway and/or b-roll. However, it was almost useless to me in shooting situations involving brilliant sunshine or bright lights. A quick visit to the B&H website solved the problem with the discovery of the Hoodman Cinema Kit Pro. For the $$$$, it was the perfect solution. Unlike other mounts which require rubber band-like supports, this fits snugly to my camera body, still allows use of the hot shoe and the optics are adjustable to my eyesight. I wouldn't hesitate to recommend this product my friends. Is this compatible with a Panasonic GH3? When I twist the eyecup for 3x magnification, it is blurry and I can't get it to focus. Anyway around this? Thanks. Please contact Technical Support at 800-818-3946. It serves a nikon d810?, it's compatible? Yes, The HCKP will fit the D810.The HCFN is another alternative for the D810. Will this fit on a sony a7s multi-shoe? It should fit. But it might not lock in well. The Sony multi-interface shoe is a bit deeper than a standard DSLR shoe. And Hoodman has not specifically tested it for compatibility. Is it compatible with GH4? It will work on the GH4. It is adjustable enough that it will fit. It is not specifically designed for the GH4 it will work but will not be a perfect fit. Does this hoodman fits and works with a Canon T5i?? Does this fit a Nikon D600? The Hoodman Cinema Kit Pro is compatible with the D600, yes. Would this work on a Canon 60D? Thank You. The Hoodman Cinema Kit Pro will be compatible with the Canon 60D.